He became captain after the original captain Howell Davis was shot dead. He accepted: “It was better being a commander than a common Man.” His first voyage was revenge on the people who had killed Howell Davis and then in July 1719 he sailed for Brazil where he began his full-time piratical career, during which time he was estimated to have captured 470 ships. One ship had aboard 40,000 gold moidors and jewellery for the King of Portugal. 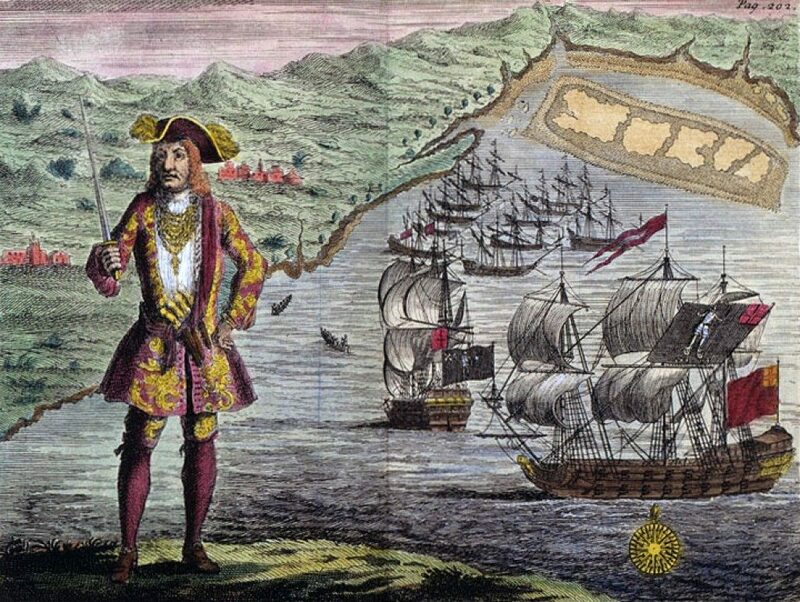 In February 1720 the French pirate Montigny la Palisse joined Bart and the authorities in Barbados sent two armed ships to stop the pirates. In the encounter, the French pirate ship fled and Bart’s ship suffered damage. Bart swore vengeance against Barbados and Martinique, who had also sent ships to hunt him. He then sailed north to Newfoundland. On 21 June he attacked Trepassey harbour and captured 22 ships. The next month, he captured another ten ships and then headed for the West Indies with la Palisse who had rejoined them. In late October Bart captured 15 more ships in three days. His actions virtually brought trade in the West Indies to a halt. On 5 February three of Bart’s ships were involved in a skirmish with HMS Swallow that left ten pirates dead. Five days later, in another encounter with the Swallow, the end came. Black Bart, dressed in his best clothes was killed by grapeshot cannon fire, which struck him in the throat while he stood on the deck. To prevent his body being abused or displayed post mortem, the crew threw it overboard. It was never found. The nickname Black Bart was never used during John Roberts’s lifetime.